Possessing the capability of giving some extremely important insights into what’s exactly going on, a dog’s body language can be an absolute eye-opener! A good understanding of your pet dog’s body language will not only help you decipher what he wants but also deepen the bond you share. What entails this interpretation is the discernment of not just the conscious body language of your pet dog but also the unconscious one - when he is sleeping. 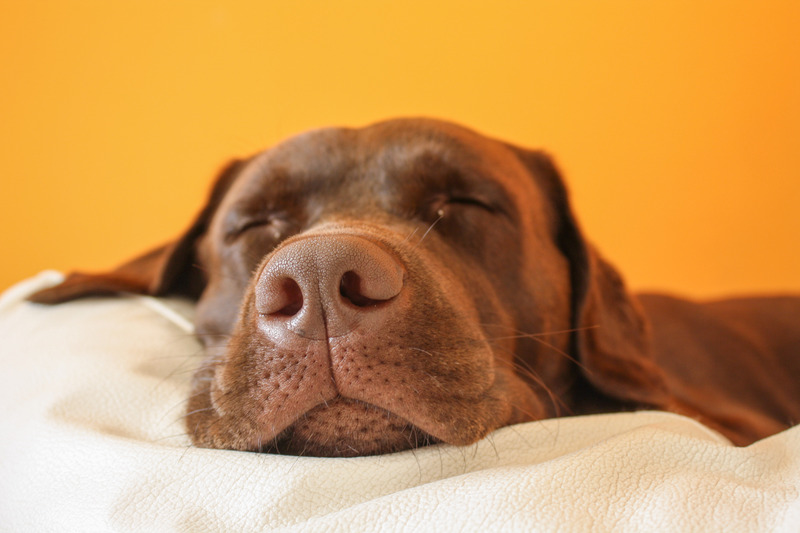 And so we list down the possible explanations of your dog’s sleeping positions! Ever contemplated why “my dog sleeps against me” or “why does my dog sleep so close to me” as he gets a shuteye resting on his side next to you? Well, rest assured (literally! ), there’s nothing to worry about this one. One of the most common dog sleeping positions, sleeping on the side indicates that your dog is feeling a sense of calm and is absolutely well-rested, whether next to you or not. Sleeping on his side further indicates that he feels comfortable and secure in his company and surroundings. When not sleeping, these dogs are the happiest dogs to spot! Have a little monster running all over your house? Most likely the monster passes out on his tummy, after being drained of all of his energy and overworked muscles! Thus, if you ever wondered “why does my dog sleep on top of me” or “why does my dog sleep between my legs” as these are primarily the positions that involve sleeping on the tummy, you must be alert as the position indicates strain and discomfort. A common observation that goes hand in hand in with this position is that the dog easily slips into a rather deep slumber! Tucked paws and a bagel-resembling pooch? This coiled up sleeping position is another common one but not many know of its indication which is the protection of body parts and conservation of body heat. Also a common one among other dog sleeping positions with owner, albeit involving some distance in between. However, there’s another side to this tail-to-nose sleeping position - that of a sweet disposition! If you know your pet dog is a tender personality, this position is just a natural sign of an introverted affection. Having covered the Only On the Tummy position, the On the Tummy and Legs Stretched Out One is a sign of a tired baby ready to jump back any minute! That’s right -- although it may look like the dog is tired beyond his capacity and may take a while to come out of his sweet siesta, watch out for him to spring up any moment because this baby is all about extra power! While how your dog sleeps with you is something you must look into, even dog sleeping positions with you not being around can be as insightful. Regardless of your presence or company, a dog can go off to sleep in positions including but not limited to his legs up in the air. Of what may look like a rather funny sight, this position indicates utmost comfort. This as comfortable as it can get given that an exposed belly is a sign of submission and vulnerability! Having read the above, you are now pretty well-versed with dog sleeping positions and what they mean. Whether you are a pet parent or not, understanding this can be extremely handy, so share the word!